NOT JUST A WORD SEARCH BOOK. THIS BOOK IS FILLED WITH UNIQUE WORD SEARCH PUZZLES THAT WILL HAVE YOU WANTING MORE. FUN FOR TRAVEL AND WAITING ROOMS. Dictionary Word Search is a fun and new way to do a word search. Each word search has a definition and some of the words within the definition are bold. The bold words are the words to search for in these word searches. With 26 word searches this book will surely entertain and please the word search lover. 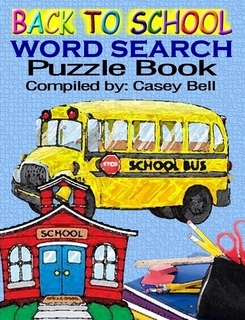 Casey's "Back to School" Word Search Puzzle book is filled with puzzles that pertain to school. It is much fun for all who are experiencing school. Do you love music? Well, this word search book is for you. 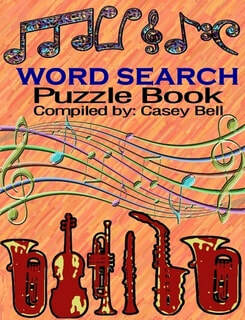 Filled with musically searchable puzzles this book will keep you humming and singing. Click cover to order your copy.